I'm sure just about everyone realizes now that you can play poker online (which you probably have learned from the thousands of Full Tilt Poker and PokerStars TV commercials), but did you know you can also play video poker online? Just like there are online poker rooms, there are also online casinos. These casinos offer all of the games you would expect from a live casino, including Slots, Roulette, Craps, Blackjack, and of course our favorite, Video Poker. Online casinos let you practice for play money, and even deposit and play with real money if you so choose. We love online casinos because they are the perfect practice tool for video poker players- you can sit back in your living room, fire up the software, and start playing video poker without even putting on a shirt. 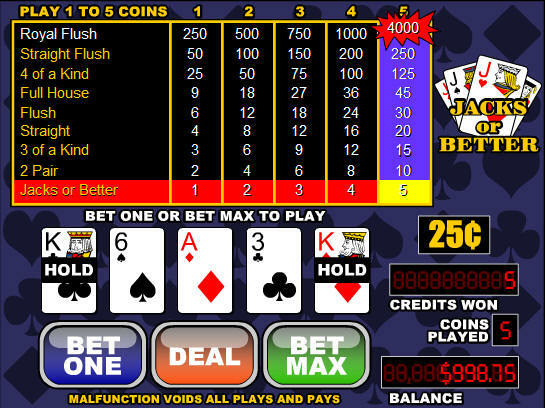 You can even use your favorite video poker tool to figure out tricky hands if you need help! The online casinos listed in the chart above are our personal favorites, and we think they are the six best possible options for an online video poker player. However, if you already play at the casinos listed above, or would like to learn about other options you have, make sure to check out our full list of online casino reviews. The rest of this page will be a Frequently Asked Questions outline that will teach new players about online video poker and online gambling in general. Do all casinos accept all players? How do you deposit money to online casinos? How do you withdraw money from online casinos? What video poker games are offered at online casinos? What are the pay tables like at online casinos? What is a "sign up bonus"? Do these "sign up bonuses" apply to video poker players? Do all casinos have their own custom software? We'll start with this one. No one has an exact count of how many online casinos there are, because there are always small ones popping up and old ones dropping off the radar. In our estimate, though, there are between one thousand and two thousand online casinos. The majority of them are just clones of each other, and that is why we have only listed the cream of the crop on our website. No. Most casinos accept either only non-USA players (like PKRCasino), or accept all players (like Bovada Casino). Some casinos even accept all areas besides Canada (like Bovada Casino). The reason for this is because if a casino is located in a certain area in the world, laws may prevent them from servicing all markets. The market with the most legal issues is the United States. If you are seeking a USA friendly casino, we recommend Bovada. If you would like more of a selection of USA accepted site then have a look at these online casinos for usa players or this best online casinos for us players lisings as they review most of the USA allowed casinos. This is an often-asked question, but we can't provide you an exact answer without knowing your individual circumstances. The country with the most hazy laws is the United States, and I have never heard of anyone being arrested there for playing at an online casino. The UIGEA (Unlawful Internet Gaming Enforcement Act) of 2006 stated that it is illegal for banks and credit card companies to process online gambling transactions, but says nothing about whether or not it is illegal to be the player. Seeing as how there has never been an arrest or even an investigation targeted at a player, I would not worry about it. The most common methods of deposit are credit cards, eChecks, and eWallets. Almost every casino accepts Visa and MasterCard deposits, and even if you are in the USA most of the Visa and MasterCard credit cards work just fine. An eCheck is just an electronic check - you provide the casino with your bank's routing number and your account number, and you can instantly transfer funds from your bank account to your casino account. eWallets are online wallets that work just like PayPal. You can put money into the eWallet through use of your credit card or bank account, and then deposit it to the online casino of your choice. eWallets are more popular in Europe because USA players cannot use them. I recommend using either a credit card or an eCheck to deposit, because there are never any fees involved and they are both instant transactions. eWallets are just a middle man in my eyes, because you have to use a credit card or eCheck to fund them anyways, so why not just cut them out (especially because of their high fees!). Players can usually withdraw either by check (mailed to your house), bank wire, or by refunding the money to the deposit method you used. For example, if you deposited using an eWallet, you can easily withdraw directly to the eWallet. For more discussion on depositing and withdrawing, read our full guide to real money video poker. This is another commonly asked question. Many players feel like it is impossible to win at online casinos, but that certainly is not the case. Although the odds at most online casinos are a little tighter than at live casinos, the online casinos certainly aren't cheating players or stealing money (with the exception of a few rogue casinos that quickly go out of business). As long as you stick to the online casinos listed on our site, you can rest assured knowing your money is safe and the odds are true. In fact, all of the casinos on this site are audited regularly by third party testing agencies that affirm their fairness and randomness. Most of the casinos offer between five and twenty total games. Also, almost every casino offers the games in single hand as well as multi hand play - the most hands I've seen are the 100-hand games at Bovada Casino. As I discussed in an earlier answer, the games are a little tighter, but still fair. Almost all the online casinos listed on our site offer at least full pay Jacks or Better which pays out up to 99.54%. That is easily the highest paying game in the casino, as most games like Slots or Caribbean Stud pay out 95% or worse. Besides Jacks or Better, most of the pay tables are of the low-pay variety and pay out in the 98.0%-99.4% range. Ninety-nine percent of online casinos offer a "sign up bonus" to new players to entice them to deposit. These sign up bonuses are often a percentage match on the size of their deposit, such as a 100% up to $500 bonus. In that case, for every dollar you deposit up to $500, you will receive one dollar of bonus money. The catch with sign up bonuses is the fact that you have to "clear" them before you can withdraw the money. Most casinos will put the bonus money in your account right away, and then require you to wager the total amount (deposit plus bonus) twenty to fifty times before the bonus is yours to keep. Of course, you can always withdraw your deposit money at any time - it is just the bonus money that has the withdrawal requirement. For the most part, no. Since video poker is already such a low house edge game, the online casinos cannot really afford to offer video poker players much more. Yes. However, you will have to play at the flash versions of online casinos instead of the Windows downloadable versions. Every casino on this site offers both a flash casino as well as a downloadable one, so you still have the same options as a Windows player. Still looks pretty good, huh? No. Most casinos choose to outsource their software development to special companies who strictly develop casino software. These online casino software developers have years of experience and are able to put together outstanding packages for new casinos in a jiffy. Ready to play video poker? We recommend starting with this realistic Jacks or Better game at Bovada Casino. Bovada is a USA friendly casino that offers a 10% bonus that even applies to video poker players! One of my favorite parts about Bovada Casino is that you don't have to download the casino to play - you can practice right in your web browser. Join Bovada Casino now!